ARTful Creatures Now Frames Artwork! We are pleased to announce that we can now offer framing as part of our service. If you commission a piece of artwork form ARTful Creatures, buy one of our limited edition prints (see below) or have artwork from elsewhere we can frame it! We are happy to discuss your requirements and to give advice on suitable mouldings and mounts for your artwork should you require it. 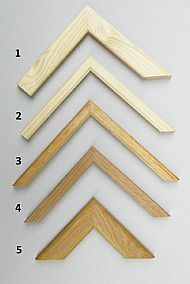 All frames are individually hand made to order using good quality materials. Our aim is to help show off your artwork to its best advantage and we are happy to work with you to achieve this. Each piece of work will carried out in accordance with our Framing Guidance Notes, which outlines our terms and conditions. 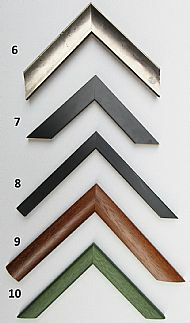 We have a range of picture mouldings (frames) to choose from. Please see the images below for more information. We also have a selection of mount boards available. We can supply standard picture glass, non-reflective and UV protected glass. Please ask for more details. Please email or call Lyn to discuss your requirements at lyn@artfulcreatures.co.uk or call 01408 641 204. ARTful Creatures believes in providing affordable art for all to enjoy. Please see our extensive range of high quality Limited Edition Wildlife Prints (from original watercolours by Lyn Wells) here. Our framed prints cost from as little as £90 and make a beautiful gift that will last a lifetime.